When someone says, “the most famous diamond in the world,” what is the first diamond that you think of? 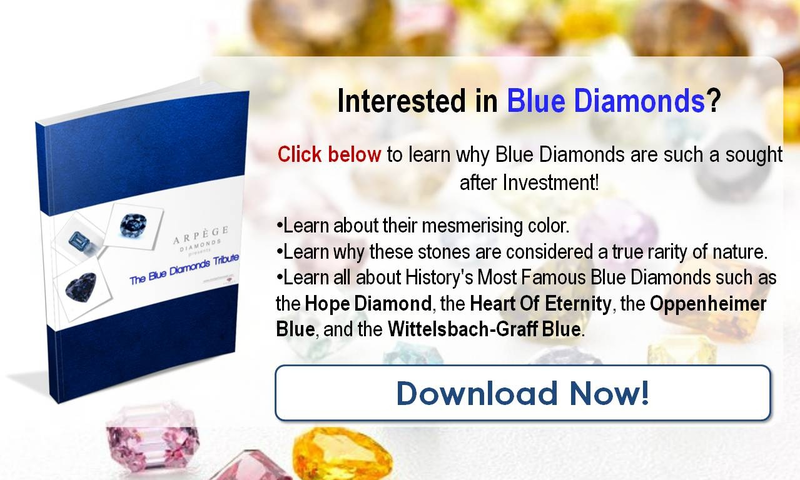 Odds are it is the truly breathtaking Hope Blue Diamond; possibly the most well-documented blue diamond in the world. The antique cushion cut diamond is 45.52 carats in its current incarnation and is classified as a Type llb diamond, or one containing no measurable nitrogen impurities. However, the “b” means that these diamonds do contain boron impurities that give the diamonds a light blue or gray color. Although it is named for Henry Philip Hope, the blue diamond has also been called the Tavernier Blue, Bijou du Roi, and Le Bleu de France, and was once the possession of Louis XIV of France. 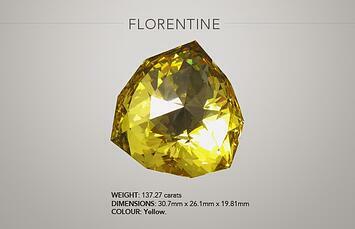 The gem was first brought to European notice when in the possession of Jean Baptiste Tavernier, a 17th century traveler and gem merchant who also specialized in diamonds and accounted among his many finds not only the Hope Diamond, but the 63 carat Kolluru Diamond and the 137 carat yellow Florentine diamond. Both of these legendary diamonds' whereabouts are currently unknown. Thought to originate from the Kollur Mine in the ancient diamond production center of Golconda, India, the gem was purchased by Tavernier in the mid-1600s as a 112 carat, roughly triangular stone. Tavernier characterized it in his writings as a beautiful violet color stone. It was recut in 1673 by Louis XIV’s court jeweler, who trimmed it down to a 67 carat stone worn by the king on ceremonial occasions. King Louis XV had the stone reset yet again as a piece of ceremonial jewelry. However, misfortune befell the royal house when Louis XVI and Marie Antoinette attempted to escape from France, and the contents of the French royal treasury – including all the jewels – were turned over to the government. 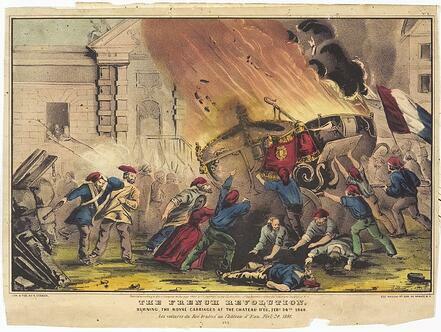 In 1792 the diamond was stolen after a week of looting and rioting. 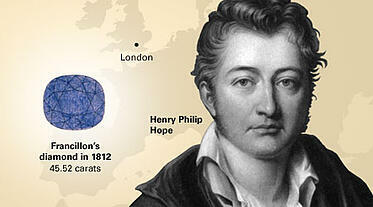 The diamond did not turn up again until 1812, in the inventory of a London diamond merchant named Daniel Eliason. The stone was weighed as 44.25 carats, suggesting that the stone had been recut during its absence, and it apparently entered into the ownership of the royal house. Upon the death of George IV, the king’s enormous personal debts had to be settled and the diamond was sold through a private channel, not to emerge again until 1839 as the property of Henry Philip Hope. It was his death in 1839 that caused the diamond to pass to his nephew and then to his nephew’s grandson. In 1901 Lord Francis Hope sold the stone to another London diamond dealer to pay off his debts. The stone then crossed the Atlantic, ending up as the property of Joseph Frankel’s and sons in New York City. They in turn sold it to another diamond dealer when they needed money. The stone then turned up in 1909 at an auction in Paris, where it failed to sell, but later ended up in the hands of renowned jeweler Pierre Cartier. From there was reset in a three-tiered circlet of white diamonds in order to tempt Evelyn Walsh McLean, a diamond loving Washington DC socialite and mining heiress. The diamond was again reset as a pendant on a necklace of white diamonds and remained in the possession of Mrs. McLean until her death in 1947. 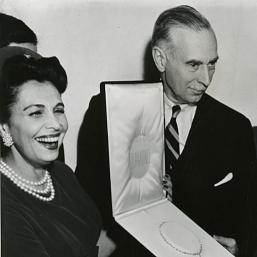 Harry Winston, the famous jeweler, purchased Mrs. McLean’s collection of jewelry which included the 94.8 carat Star of the East diamond as well as the Hope Blue Diamond. It remained in his possession until donated to the Smithsonian Institution in Washington, DC, where it has been one of the star attractions in the hall of minerals, outstanding even among other pieces donated by Mr. Winston. But What About the Curse? What you have to understand about the curse of the Hope Diamond is that curses and paranormal claims were the click bait of the times. Legends say that it was originally stolen from the gems that adorned an idol in a Hindu temple until it was plucked out by a thief who was then torn apart by wild dogs. Of course, no mention of this was made by Tavernier, who has at varying times been accused of being the thief in question, who died in Moscow at the age of 84 in the year 1689. If he was torn apart by wild dogs, they took a very long time to find him. Likewise, misfortune did not truly befall the French royal family for over 100 years until the French Revolution resulted in the arrest and execution of Louis XVI and Marie Antoinette. Nor did misfortune befall many of the subsequent owners, though tales of suicides, murders, madness, and other misfortunes abound. Though Evelyn Walsh McLean can be said to have more than her share of tragedies, losing a son to a car accident, a daughter to an overdose, her husband to another woman, she never blamed the diamond for any of these occurrences and died of pneumonia at the age of 60. What are your takes on this breathtaking stone? Do you think it is a cursed item, or a true work of art? Let us know! And as always, feel free to follow us on Twitter and LinkedIn!